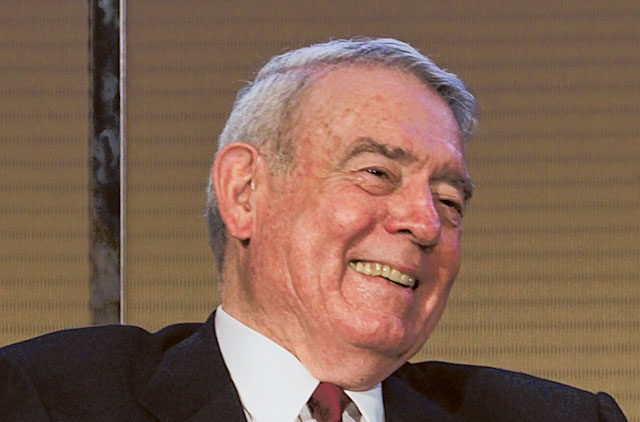 Dubai: US newsman Dan Rather on Friday discussed with a Dubai audience his “spooky” encounters with the late Iraqi dictator Saddam Hussain preceding the two Gulf Wars. Rather, a former TV presenter at American news giant CBS, recalled the experiences during the Emirates Airline Festival of Literature. The 81 year old had been granted rare access to Hussain on two occasions before the wars in 1991 and 2003. “It was spooky, I met him [Hussain] the first time after he invaded Kuwait. I went alone, there was not another person with me,” Rather said. He made the comments during the Rather Outspoken session on his professional life’s highlights, with the BBC’s Nik Gowing pressing him on controversies and accomplishments. “I was awakened in the middle of the night by two men with automatic weapons. ‘Maybe you don’t get out of this’ — these thoughts go through your mind,” Rather said. He again found himself facing the powerful Iraqi president — who was eventually hanged in Iraq in 2006 — in an interview not long before the onset of conflict a decade ago. “Saddam denied [to me] he had WMDs [Weapons of Mass Destruction]. He said he had demonstrated the evidence. I didn’t believe him, there were lots of reasons for that. Gowing asked Rather what his views were today — ten years almost to the day Iraq came under attack on the said pretext of an alleged WMD programme. “He didn’t have the weapons,” Rather replied.